“Beans & Rice” are like one of the easiest Vegan meals that were ever invented……but they can be a bit – well…. boring! So turn them into AWESOME VEGAN TACO BOWLS instead! And to make it even MORE awesome? Douse the whole thing with some Homemade Taco Bell Fire Sauce! 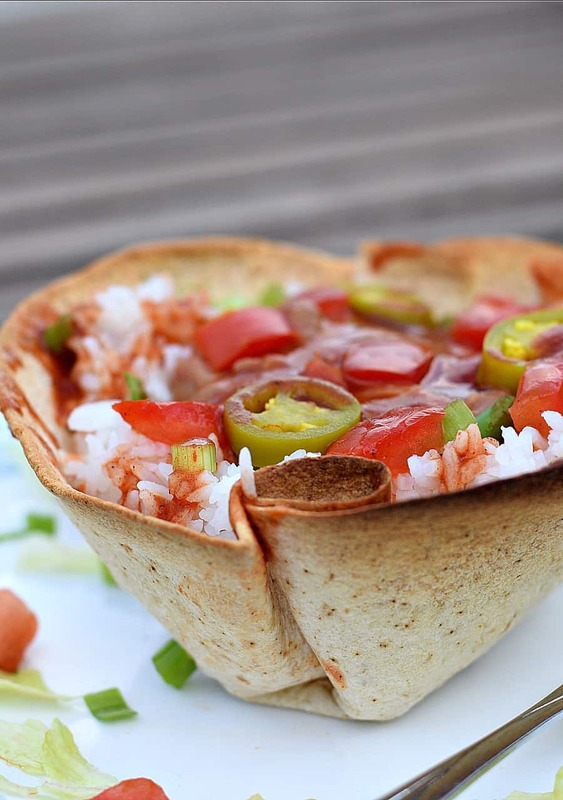 ¡Yo Quiero Vegan Taco Bowls! Why haven’t I thought of this before? I can’t even begin to tell you how GOOD they are! A crispy, crunchy baked tortilla filled with steaming rice, with a big scoop of refried beans right in the center. Add plenty of fresh veggies and some killer sauce – and be prepared to defend your plate! Why the sauce? Oh sure you can use Salsa and they will still taste amazing – but we’re talking comfort food here! And as I was digging around in my junk drawer – (EVERYBODY has a junk drawer…..don’t they?) – I stumbled across one of those little packets of Taco Bell Fire Sauce – and all those nostalgic memories of Taco Bell came slamming home…..
Taco Supremes, Burrito Supremes, those little tubs of Pintos & Cheese. Taco Bell was like the ultimate comfort food for me. And after looking at the ingredients on that spice packet – I knew I could make my own (without all those weird preservatives or chemicals). This recipe is really about the sauce – because the bowls themselves are super easy. Soften a tortilla (corn or flour) by wrapping in a barely damp cloth or paper towel and microwaving on High until steamed and pliable, about 30 seconds. Then gently stuff it inside an oven safe baking dish forming a bowl (I use Corningware) and bake at 375° F until crispy – about 10 – 15 minutes. For those of you who I know are going to ask – there are fat-free tortillas available. Our local Whole Foods carries the Engine 2 line of products, and they have a few to choose from. Once the tortillas crisp up, carefully remove them from the baking dish and allow to cool before using. The bowls can be filled with freshly steamed rice, forming a well in the middle to add the beans of your choice. I like to mix a can of Fat Free Refried Beans and Low Sodium Pinto Beans together. Then simply garnish with any veggies you want. My Amazing Cheese Sauce would be good on these as well. Now – on to the sauce. This recipe makes about 32oz of sauce, enough to fill a recycled Ketchup Bottle. In a large saucepan, combine 3 cups of water and a 6oz can of Tomato Paste. Then whisk in ¼ Ketchup, 3 Tbs White Vinegar, 1-3 Tbs finely minced Pickled Jalapeño Slices (or juice – depending on your comfort level), 4 tsp Chili Powder, 2 tsp Garlic Salt, 1/4 tsp Garlic Powder, 1/4 tsp Ground Cumin, 1/8 tsp Cayenne Pepper, and 1/8 tsp Smoked Paprika. Allow that to come to a simmer and then whisk in a slurry of 1 Tbs Corn Starch and 1 Tbs Water to thicken. Once the sauce begins to thicken, remove from heat and cover for at least 15 min to allow all those wonderful flavors to come together, maybe hold hands, you know – that sort of thing….. It may not be exact – but it’s pretty darn close to Taco Bell’s Fire Sauce, so I’m happy with it. 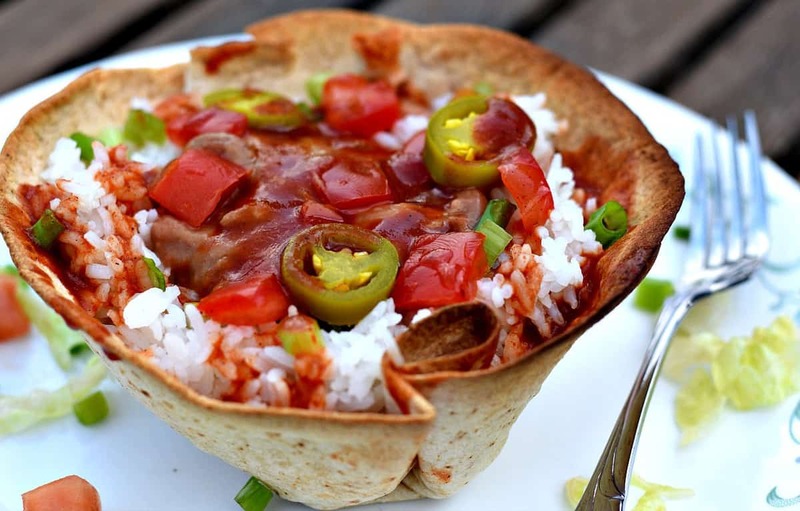 These crispy Vegan Taco Bowls feature a homemade tortilla bowl, filled with steamed rice, refried beans, veggies, and a homemade Taco Bowl Fire Sauce. In a large saucepan, whisk all ingredients until smooth and bring to a simmer. A recycled 32oz Ketchup Bottle works great as a storage container. Sauce should keep refrigerated for about a month or two. Chuck……..Are the jalapeño slices raw or the pickled slices in a jar from the Mexican food aisle? Pickled. I usually by the ‘tame’ ones but they still have a little bit of heat. I see the taco bell sauce should keep refrigerated for a month or two. Have you ever frozen it? No I haven’t – but I see no reason why you couldn’t . You are my hero. My biggest vegan challenge is finding those comforting spicy foods I just love. Thanks for this recipe! I currently am cooking a batch of your chili. Can’t wait to try so many of your recipes. I have been vegan for a while now and find joy in running across recipes for things I use to enjoy before going vegan. I love to cook and experiment. The recipe for the cauliflower tacos is amazing and my kids also love it ( they aren’t vegan… yet!). I found this recipe for the sauce and had to make it. I think the sauce is good, I had to tweak it a little for my own taste. It doesn’t taste like the fire sauce I remember, but it is still a nice recipe. Thanks!